Paul Krugman again went after Germany on August 26 in his New York Times column, "Germany’s Drag." After the German government posted a 1.2 percent of GDP fiscal surplus for the first half of 2016 — way above the IMF forecast of 0.3 percent — it seems as if Krugman couldn’t contain himself anymore. He claimed that "what we’re seeing in elite circles is a very belated but still welcome realization that monetary policy badly needs an assist from fiscal expansion." However, there are two evil opponents of more government spending: The Republican Party in the US, led by Paul Ryan (the "hard-line, Ayn Rand-loving and progressive-tax-hating conservative"), and Germany. However, his critique of the German austerity measures seems rather dubious, considering that European countries with budget surpluses or small deficits have clearly done better than countries with high deficits since the economic crisis. One just needs to look to countries such as the United Kingdom, Ireland, or even Spain — the countries that reduced their deficits significantly in recent years — and compare them with Greece or Portugal. One will easily discover which policies worked better. Also, Scandinavian countries, which Krugman is generally very fond of, have consistently posted small deficits or even surpluses in the past, as well. In 2015, Norway reached a surplus of 5.7 percent of GDP and Sweden had a balanced budget. But strangely enough, the great, socialist Nordic countries don’t count here for Krugman. Still, there seems to be a clear correlation between economic growth and low deficits, as can be shown in the following graph. This shouldn’t come as a surprise either. "Public austerity is a necessary condition for private flourishing and a rapid recovery," as Philipp Bagus writes. Meanwhile, more stimulus programs would further worsen the situation and just introduce another artificial and unsustainable boom. Still, Krugman thinks that a "fiscal boost" is needed because of the "lowflation" occurring in Europe. However, the low price inflation seems to disguise the true situation. The money supply has increased by 4.8 percent in the last year, housing prices have soared in several countries and caused shortages in cities, and the Euro Stoxx 50, a stock index of the eurozone, has gone up by 34.4 percent in the last five years (and by 234.2 percent since 1987). Furthermore, government debt to GDP ratio has spiked in the last few years — which by the way puts huge doubts on the so-called "austerity" imposed by Germany. Altogether, a lot has been done already. Just because it doesn’t show up in the price inflation (yet), doesn’t mean that we are in an age of fiscal constraint. One thing that Krugman gets right is that prices and wages are "misaligned within Europe" and that some countries, especially in the Mediterranean, need an internal devaluation. However, it isn’t clear why Germany is responsible for that. To the contrary, unlike most states in the EU, Germany has gotten over the devaluation already and because of that is in a better shape. In the 1990s labor costs decreased significantly, as is shown in the graph below, and German companies invested heavily abroad, thereby becoming more competitive — that in comparison to other countries, where wages have increased. Additionally, the German government introduced the controversial "Agenda 2010" program in 2003, which included tax cuts (including steep cuts of income and corporate taxes), reductions in unemployment benefits, and a decrease in pension benefits. It is noteworthy that these policies were introduced by the Social Democratic Party (i.e., by "democratic socialists" as Bernie Sanders would say) and the then-chancellor Gerhard Schröder, who had to step down afterward. 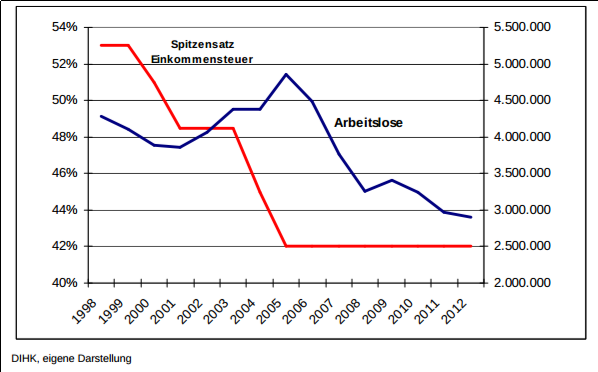 Thanks to these reforms in the 90s and early 2000s, Germany was able to end (or at least decrease) its economic problems. Greece was admitted [to the European Monetary Union] at a very high exchange rate. At this rate and prevailing wages, many workers were uncompetitive compared with the more highly capitalized workers from Northern countries. To alleviate this problem, the alternatives were to (1) reduce wage rates to increase productivity, (2) increase government spending to subsidize unemployment (by unemployment benefits or early retirement schemes), or (3) employ these uncompetitive directly as public workers. Owing to strong labor unions the first alternative was put aside. Politicians chose the second and third alternatives which implied higher deficits. With that, the problems of the European Union are not austerity or Germany forcing everyone to restrain spending. When it comes to countries such as Greece, Italy, France, or Portugal, there are other barriers for improvement. One is extreme labor unionism which hinders governments to introduce even slight reforms. Another are the governments themselves, who think that they can solve all the problems in the world. And lastly, the European Central Bank also creates major obstacles. Most of the newly produced money goes to southern countries, thereby raising labor costs even more. What the EU countries need are free markets. States should privatize, deregulate, cut taxes (and not increase them as Germany demanded from Greece), and get rid of a central banking system that promotes inflation and spending. This also holds true for Germany. It probably doesn’t help to let 1.1 million refugees into the country in 2015 alone and provide for all of them (which costs 1,000 euros a month per person), as Angela Merkel has done. It probably doesn’t help either to call for a lowering of the pensionable age, as the Left Party does, when the pension system is close to bursting and the Cologne Institute for Economic Research just calculated that the minimum age needs to be increased from 67 to 73 years to even finance the system. Martin Masse is correct when he writes that "Europe needs … smaller governments. … There will be sustained growth in Europe only when governments, and not citizens or businesses, finally bear the brunt of austerity." Krugman’s proposal of more government spending, more stimulus, and more aggressive monetary policy would meanwhile lead to chaos. Kai Weiss is studying International Relations and Management at the University of Applied Sciences in Regensburg, Germany.